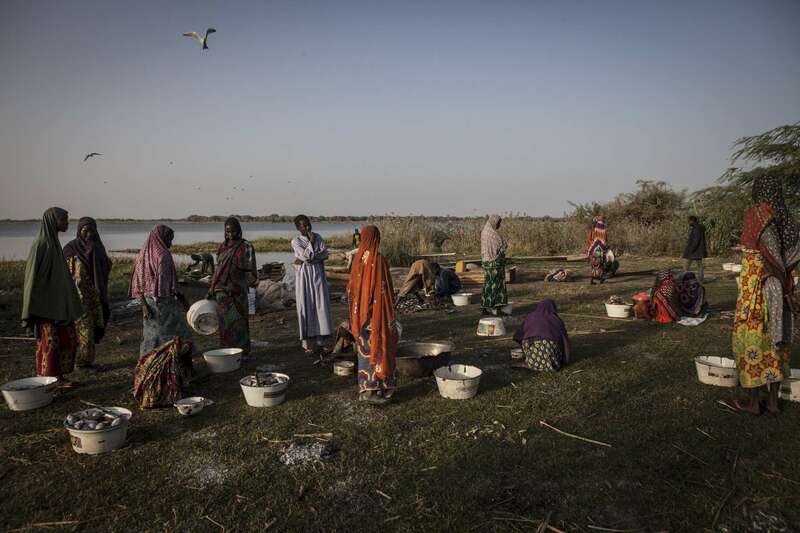 Women wait for fishermen to arrive with their morning catch to clean and sell at the market on the shores of Lake Chad in Tagal Village, Baga Sola, Chad. In late 2014, Boko Haram attacks began to spread beyond the borders of Nigeria into the neighboring countries that border Lake Chad. Inhabitants of the many small islands within the lake fled to the mainland as multinational forces battled the militants. Displaced families who survived the violence were left with little prospects due to the lack of farmable land and the many security restrictions on the areas of the lake where they could fish leaving the population to depend on irregular food distributions from underfunded aid organizations and the charity of others.